Jonathan Choe reports on Sam Halpern, a first grader beating the odds after fighting a rare bacterial infection earlier this year. There’s no stopping Sam Halpern. He’s your typical, high-energy first grader. But only a few people can say, they know what it’s like to walk in his shoes. Halpern is living life as an amputee. "In his case, below his knees and his right hand, and some amputation on the knuckles on his left hand," says his mom, Michelle Halpern. She says he contracted a rare bacterial infection earlier this year called toxic shock syndrome. "I knew he was dying; my question was, could we save him?" says Halpern. A team of doctors, including Carlos Duran, did save his life, helping Halpern beat the odds. "His chances of full recovery of life was like less than 25 percent," says Duran, a pediatrician at Shriner’s Hospital in Boston. 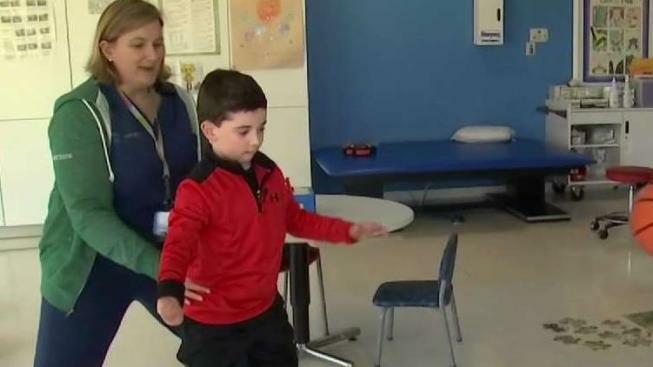 Now, this 6-year-old is thriving with the help of his support team at Shriners and already thinking about the future walking comfortably in his own shoes. "I want to play like college football when I get like a grown up," says Halpern.